Enjoy my keto pad thai made with cabbage noodles. 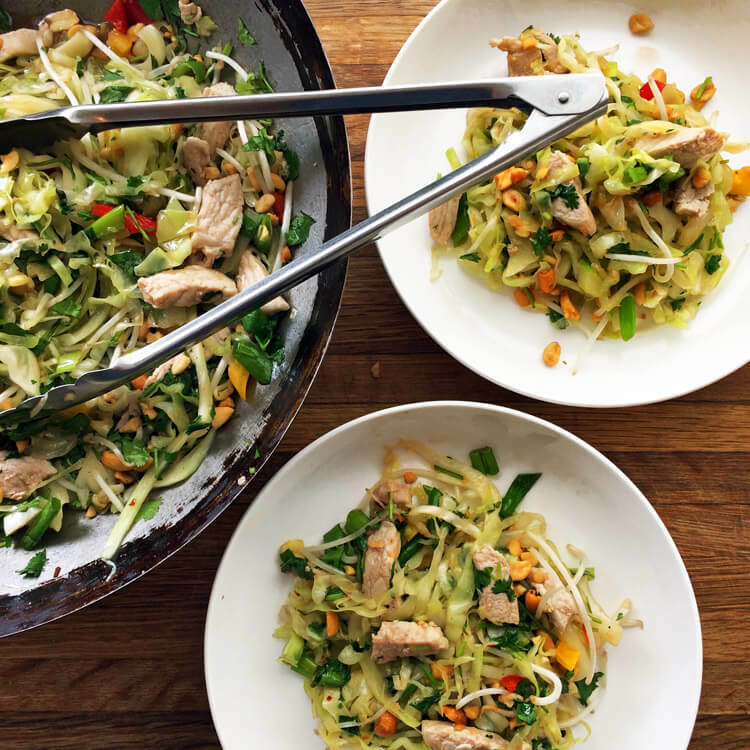 You will love this keto friendly version of classic pad thai! This recipe includes pork, but you can use scrambled eggs, tofu, beef, shrimp, and more. View all my Keto Recipes at Tasteful Keto. Delicious pad thai made with pork and cabbage noodles. Use a wok or large pan to cook the ingredients. Process all the ingredients. Cut the cabbage in half, then slice into thin noodles (1/8 inch thick). Wash, dry and chop the cilantro and green onions. Crush the peanuts and garlic. Thinly slice the pork, then cook in a pan or wok until dark and tender. Make the sauce. Whisk the fish sauce, tomato paste, liquid stevia, and red pepper flakes in a small bowl. Stir fry the sliced cabbage, coconut oil, and garlic in a large pan or wok. Continually toss on high heat for 12-15 minutes. The cabbage will be done when it is soft and noodle-like. You should be able to curl it around a fork. Pour the sauce into the cabbage and stir. Add the peanuts and continue to stir. Turn off the heat. Add the pork, green onions, cilantro, and salt. Continue stirring until the ingredients are evenly mixed. Plate and garnish with more cilantro and crushed peanuts. Visit Keto for Weight Loss to learn more about cooking and nutrition. View all Keto Recipes by Tasteful Keto!